Alienware's updated Alpha R2 gets a big graphics boost over its predecessor. The Alienware Alpha R2 gaming console has something to prove. 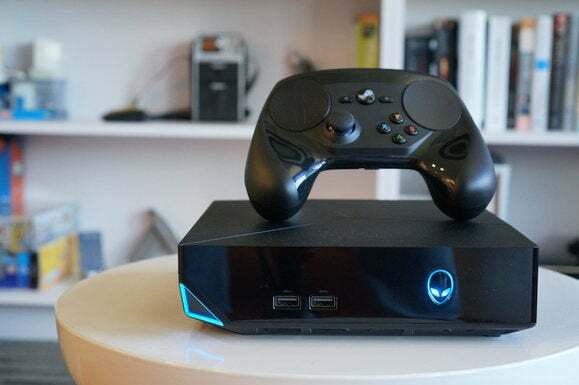 When the first Alienware Alpha debuted in 2014, it failed to lure the faithful away from their Xbox Ones and PlayStation 4s. Still, its utility as a great little affordable gaming computer was undeniable. The Alpha R2 is an updated version that packs in a ton more performance. Unfortunately, this new gen isn’t nearly as affordable as the original was. 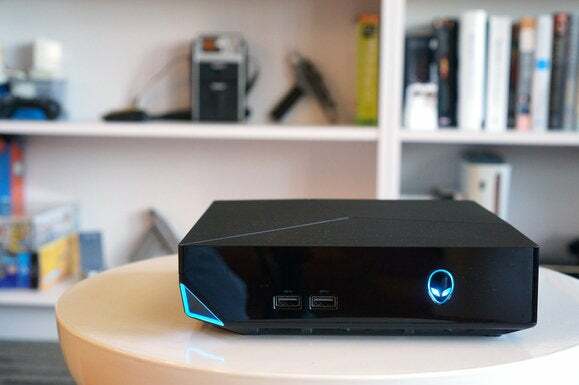 Outside, Alienware’s tiny gaming PC looks exactly the same as its predecessor. Much has changed inside, however, especially in storage options and graphics. Here’s the Valve Steam Controller on top of the Windows-based Alienware Alpha R2 for scale. No, the R2 doesn’t come with the controller, kids. The first major change is an expansion of the storage choices available. One of the original Alpha’s most annoying problems was its hard drive, which dragged along like a boat anchor. If you wanted an SSD, you had to buy one separately, open up the system, and install it yourself. That’s fine if you like DIY upgrades, but a lot of people don’t. The Alpha R2’s base version comes with a 2.5-inch HDD, but an M.2 PCIe SSD is optional. Alienware will also let you configure a system with both HDD and SSD. The other important overhaul on the Alpha R2 is its graphics subsystem. The original Alpha used an overclocked Nvidia GeForce GTX 860M chip, which was a neat feat in 2014. Alienware has now one-upped itself by putting a full desktop Nvidia GeForce GTX 960 in the R2. 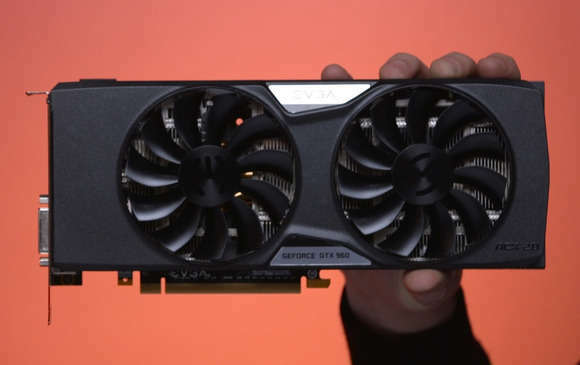 Considering that typical GTX 960 video card is almost the same volume as the Alpha R2 itself (the PC is about 8 x 8 x 2 inches), that’s an impressive bit of engineering. This is how big a typical Nvidia GeForce GTX 960 is. You can guess what the tradeoff is, though. The GTX 960 throws off almost twice the heat of the original Alpha’s 860M, so the Alpha R2’s fans are significantly louder. In a typical living room with a TV turned up to normal volume, you’d have barely heard the original Alpha’s fans while playing a game. That’s not going to drown out the tiny, high-rpm fans on the Alpha R2, but gamers who play with the volume cranked up may not mind. The fan noise does at least pay off in cooling. The Alpha R2’s GTX 960 posted a core clock speed of 1,176MHz, a boost clock of 1,201MHz, and a clock of 1,753MHz for its 4GB of GDDR5 RAM. After enduring an hour of torture in Furmark, a benchmark designed to put heavy stress on a GPU, the clocks showed no signs of thermal throttling. Alienware did its homework. 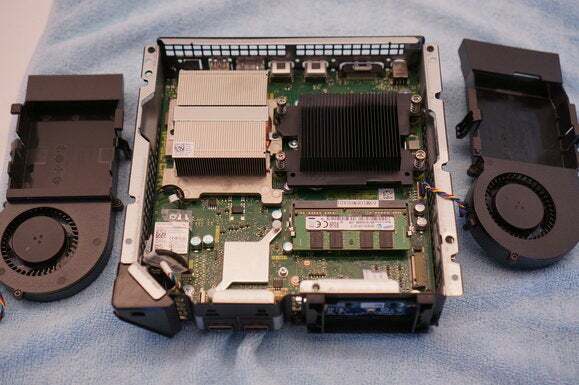 Removing four Phillips-head screws from the Alienware Alpha R2 gives easy access to the unit’s guts. Besides going from a mobile GPU to a desktop model, Alienware has also given the Alpha a decent CPU upgrade. While the original Alpha offered 4th-generation Haswell dual- and quad-core options, the R2 has moved to 6th-generation Skylake CPUs. You can select between Core i3, i5, and i7 configurations. Our particular unit came with the top-of-the-line Core i7-6700T. The ‘T’ in the name indicates it’s a lower-wattage CPU—35 watts. For comparison, a full desktop Core i7-6700 is 65 watts, while the overclockable Core i7-6700K is 91 watts. To drop from 91 watts to 35, you give up a lot of clock speed. The base speed on a Core i7-6700K is 4.0GHz, while the Core i7-6700T’s is 2.8GHz. Here are all three CPUs available for the Alpha R2, lined up with a Core i7-6700K for context. The good news is the Core i7-6700T has a healthy Turbo Boost of 3.6GHz, so the performance disparity isn’t quite as big as you’d think. In practical use, the Alpha R2 is pretty fast. The back of the Alpha R2 gives you an optical S/PDIF audio port, two USB 3.0 Type A ports, gigabit ethernet, HDMI 2.0 out, HDMI In, and a port that supports Alienware’s Amplifier GPU enclosure. Here’s the Alpha R2 compared to Intel’s nifty little Skull Canyon NUC with a quad-core Skylake processor, the original Alpha with a dual-core Core i3 chip, and our PCWorld zero-point desktop with a 4th-generation Haswell Core i7 CPU. 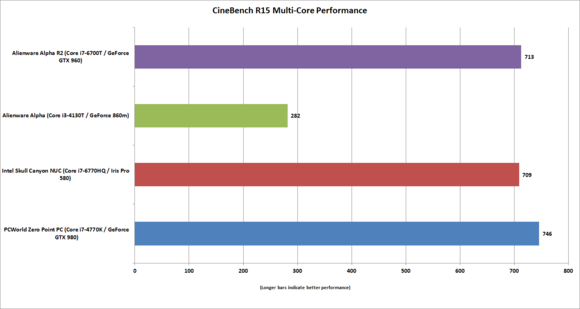 CineBench R15 is a quick benchmark that measures a PC’s ability to render 3D scenes. It’s a great way to see how a machine’s processor stacks up, as it favors those with more CPU cores. The older Haswell chip wins here by a little bit, thanks to its higher wattage and higher clock speed—even though it’s the oldest CPU. The Alpha R2’s quad-core Skylake CPU holds it own against a full desktop quad-core processor, as well as Intel’s fancy-pants Skull Canyon NUC. 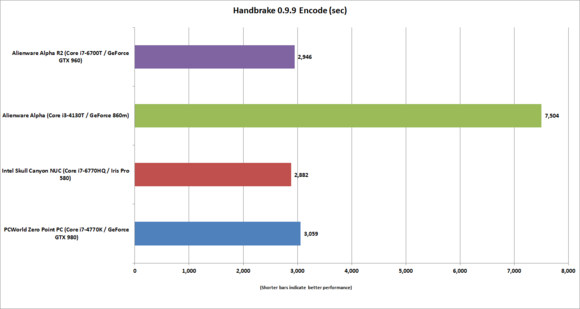 Our encoding test uses the free and popular program Handbrake to convert a 30GB 1080p video file using the Android Tablet preset. Like CineBench R15, it’s a pure CPU test and loves multiple cores. It also takes a long time to run, so machines that can’t handle the heat will show performance issues. 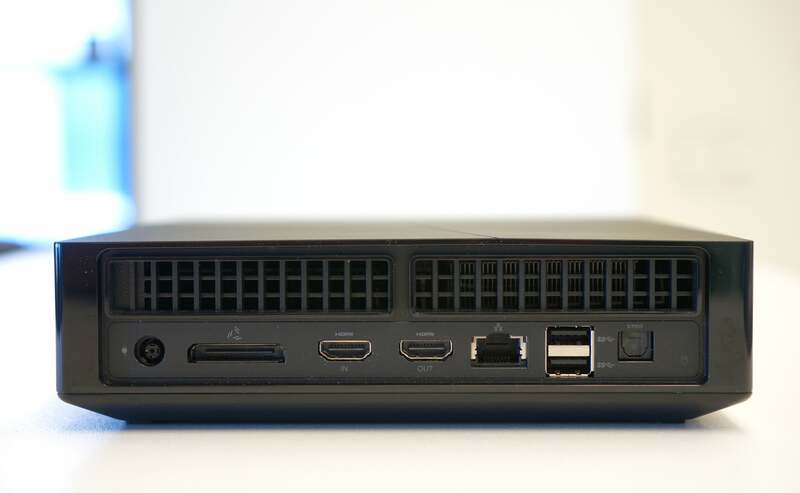 The Intel Skull Canyon NUC with its Core i7-6770HQ and 128MB of embedded DRAM leads the pack by a hair. The Alpha R2 with its Core i7-6700T comes in ahead of our zero-point system’s desktop Haswell chip, too—an impressive showing. The quad-core Core i7-6700T holds its own against competing quad-core chips just fine. The upshot for CPU performance is that the Alienware Alpha R2 speeds along just fine. More important, however, is how it does in gaming. Up first is Futuremark’s 3DMark test. It’s a synthetic gaming test, but generally respected for measuring gaming performance without favoritism. You can see there’s a world of performance difference between the Alpha R2’s desktop GTX 960 and the original Alpha’s mobile GTX 860M. Intel’s Iris Pro 580 in its Skull Canyon NUC is also pretty impressive for integrated graphics, but it still takes a back seat to the GTX 860M. Our PCWorld zero-point system serves as a point of context: It runs a GeForce GTX 980 that’s clearly much faster. In fact, the performance gap is much larger than this one test would have you believe. 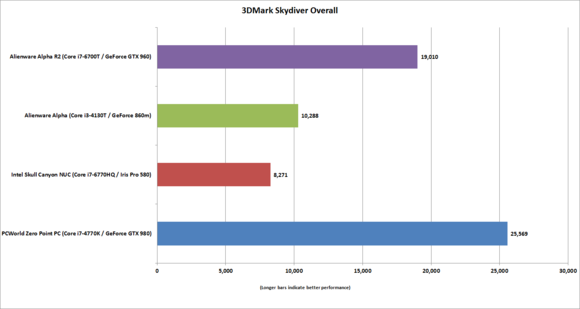 3DMark Sky Diver is a pretty light load designed to mimic mainstream 1080p gaming, so during the test, the zero-point system’s GTX 980 is just idling most of the time. So while the Alpha R2’s GTX 960 shows 70 percent of the GTX 980’s performance in this benchmark, it would fall back to less than 50 percent of the GTX 980’s output under a tougher load. The GeForce GTX 960 in the Alienware Alpha R2 doubles the performance compared to the original Alpha. What about performance in a real game? To find out the answer, we threw 2013’s Tomb Raider at the machines, with the resolution set to 1920x1080 and the graphics quality cranked to Ultimate. As you can see (and backing my assertion from earlier), the Alpha R2’s GTX 960 doesn’t really stand with a GTX 980 at all when you throw something a little harder at it. We’re looking at half the performance. But that’s not the point here. No one expects it to hang with what was once a top-tier $550 GPU. What’s most important is that the tiny Alpha R2 can push Tomb Raider with an average frame rate of 55 fps while set to 1080p and Ultimate. That’s impressive. That’s also enough to tell me that in most games, you can probably expect 1080p performance with a few settings turned down. 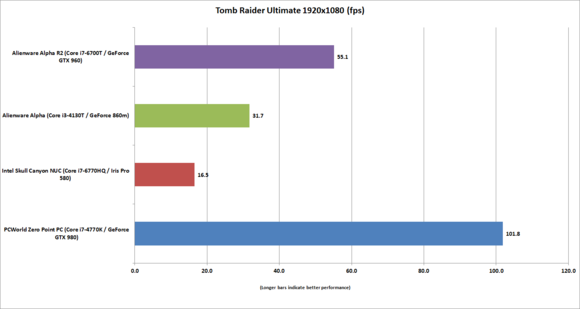 Not all games—don’t expect that level of performance in brand-new, graphically intense games like Rise of the Tomb Raider or The Division—but as I said, most games. The new Alpha R2 is capable of some gaming on Ultra or Ultimate, which the original could never handle. The Alpha R2’s hat trick for gaining more performance comes via support for the Alienware Amplifier. You can plop any modern GPU into this cabinet, and then plug it into the Alpha R2’s proprietary port to buff up its graphics output. We’d agree with that, but life is better with options. The Amplifier’s appeal is that you at least have the option to upgrade performance of the R2 in two or three years if you decide you need more performance. If every mini PC and laptop had an Amplifier port three years ago, you’d get a lot more utility out of them—if you wanted it. What’s great about the Amplifier is that it works, you can get one right now, and prices typically hover between $150 to $200. Compare that to the Razer Core, which isn’t yet widely available and costs $500 for the cabinet alone. That’s a steep markup, even if the Core doesn’t use a proprietary connection like the Amplifier does. Alienware’s Amplifier cabinet lets you use any modern GPU with the Alpha R2 and many of its laptops. Unfortunately, it’s huge. One sticking point for some people will be the Alpha R2’s cost: Our review unit’s Core i7-6700T, GTX 960, 1TB 7,200 rpm drive, and 8GB of DDR4/2133MHz RAM pushes $950. Yes, that’s without the optional M.2 SSD. When you step back and think about it, that price isn’t out of line for a mini-PC. The Zotac EN970, a very similar bare-bones system, will set you back $730 if you buy it through Amazon. Once you add storage, RAM, and an OS, you’re looking at price parity with the Alpha R2—but with the disadvantage of an older, slower Core i5 Broadwell CPU. Still, you’re probably thinking that for that much money, you could just buy a far more capable tower PC. That’s true, but the operative words there are “tower PC.” That’s going to be far larger. Ultimately, you’ll always pay a premium for miniaturization, whether you spend that cash on an Alienware Alpha R2, Zotac EN970, or Intel Skull Canyon NUC. If a tiny PC isn’t your thing, just drive on. An interior shot of the Alpha. On the right (and under a heat sink) is a low-wattage quad-core Skylake Core i7 in a standard LGA1151 socket. On the left is the GeForce GTX 960, which is permanently attached to the motherboard. You also get a lone 8GB DDR4 SO-DIMM of RAM in single-channel mode, and just in front of it is an M.2 slot. The Alpha R2’s two main negatives are excessive fan noise and inclusion of a hard-disk drive as standard. HDDs as primary drives just stink. Sure, you can fix the hard drive issue, but you’ll pay for it. The same may go for the fan noise: You may need to invest in headphones to ignore it, if you live with (or next to) people who can’t stand hearing a loud TV. 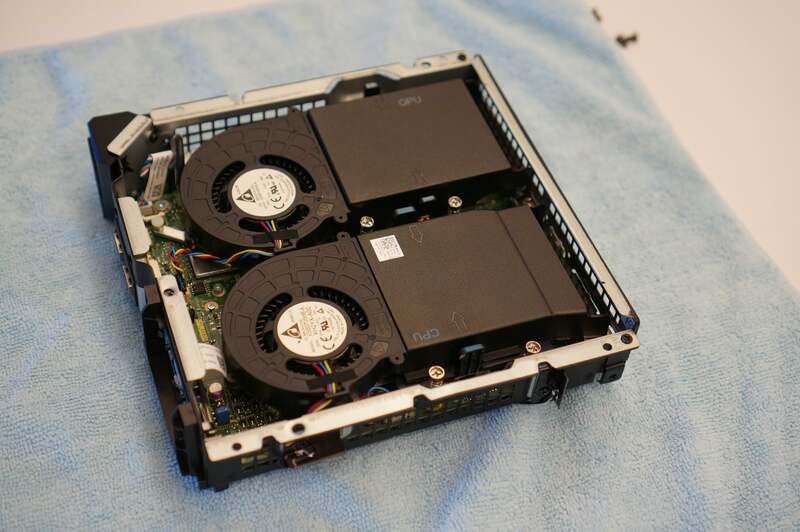 These two drawbacks don’t take away from what Alienware has done with the Alpha, though. You’re really getting a ton of performance from a machine with the same volume as a two-liter bottle. It’s capable of playing most games on High to Ultra settings at 1080p, which is an amazing accomplishment for something so small. Alienware's revised Alpha R2 jams in enough gaming horsepower to crush current game consoles, but its fan noise keeps it from being a small wonder.